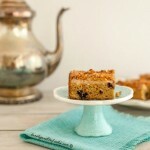 A lovely, layered blueberry crumb cake. Preheat oven to 350 F, and oil or grease a 8x8 inch square pan. Have the oven rack set to middle of oven. In a large mixing bowl combine: ½ cup coconut flour, ⅓ cup almond flour, ½ cup sweetener of choice, 1 tsp baking powder, ½ tsp baking soda, 1 tsp cinnamon, ¼ tsp sea salt. Mix together thoroughly. Set aside. In another large mixing bowl combine: ½ unsweetened almond milk, 3 eggs, ¼ cup unsweetened applesauce, 3 ½ tbsp butter or coconut oil, 1 tsp vanilla extract. Mix together thoroughly. Add wet ingredients mixture to dry coconut flour mixture. Stir together thoroughly. Spoon and spread batter into prepared pan. Set aside. With an electric mixer or blender, blend or beat together all the ingredients for the cream cheese layer. beat or blend until smooth. Spoon cream cheese mixture over the top of of cake batter layer (it does not have to cover evenly). In a medium size mixing bowl combine all crumble topping ingredients and mix and press with a fork until a crumble texture forms. Drop small spoonfuls of crumble mixture all over the top of cake and cheese layer (does not have to cover every bit). Bake in middle of center rack for 30 to 40 minutes, or until middle is firm or toothpick comes out of center with a few dry crumbs. Cool completely, and store unused portions in the fridge. This always tastes even better the next day when the flavors have intensified.